While recuperating from the naga attack, the Licktoad Pirates continued to watch the refit of Man’s Promise from afar. Several days after the attack, as the sweltering heat showed no signs of letting up, the goblins determined there was not much to do apart from baking in the heat and drinking. As they wandered the beach, the saw a flock of large birds fly from the jungle canopy. As the flock approached, a buzzing sound grew in the air and they realized they were not birds at all, but rather giant bees*! As these bees were somewhat larger than the Licktoad Pirates, they headed for cover in one of the huts on the beach, but were not able to reach it before three of the bees reached them. Fortunately, their combat skills were up to the task of squashing some insects. Later that day, the entire settlement was alarmed by a ship appearing in the cover and launching a boat. Brodo Faggins followed Rickety and his men to the dock to meet the approaching buccaneers. It was a Chelish captain, Merrill Pegsworthy. He apologized for his abrupt arrival; he was not aware there was another ship already being squibbed. He was well aware of the identity of the ship in dry dock and when confronted by Brodo Faggins, he assured the goblins he was no ally of Barnabas Harrigan and offered to rechristen their ship in the spirit of good fortune. After Captain Pegsworthy departed, Rickety approached the Licktoad Pirates and offered to discount the price on their ship’s refit if they would trek through the jungle and determine why the lookout failed to announce the arrival of Pegsworthy’s ship. Thought the sum he offered was paltry in comparison to how much the squibbing cost, they agreed that some money was better than no money and set out into the jungle. After being set upon by some angry wild boars, they found what passed for Rickety Squibs’s watchtower: a platform raised on four poles with a rope ladder surrounded by broken bottles. The watchman on duty was tangled in his hammock, swollen and dead from a giant bee attack. The recovered his weapon and dragged the boars back to the settlement to cook and serve to the workers. And there was much rejoicing (not so much for the dead watchman). The hot days dragged on as the work continued, but finally, Man’s Promise was ready to sail again. Captain Pegsworthy smashed a bottle of fine wine on her bow and rechristened her Sea Spite. The Licktoad Pirates were ready to once more set sail…. 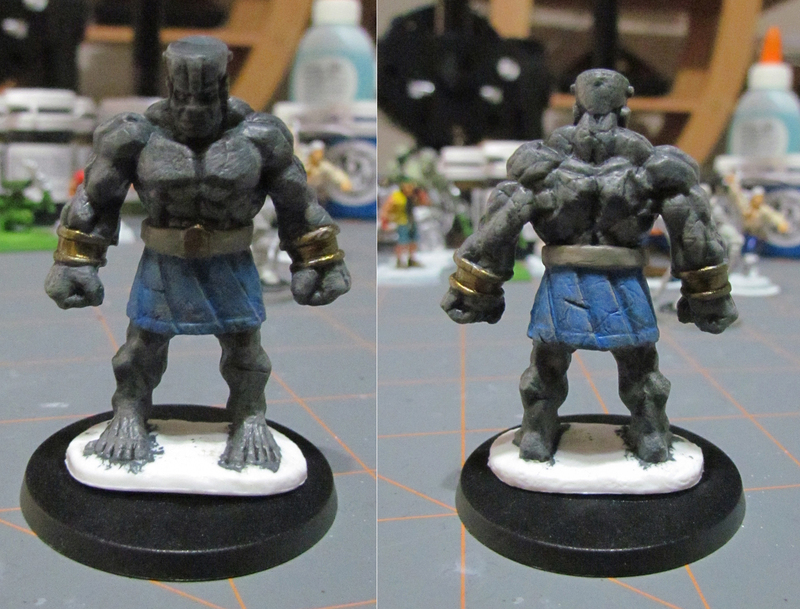 The next miniature I picked was a Stone Golem. 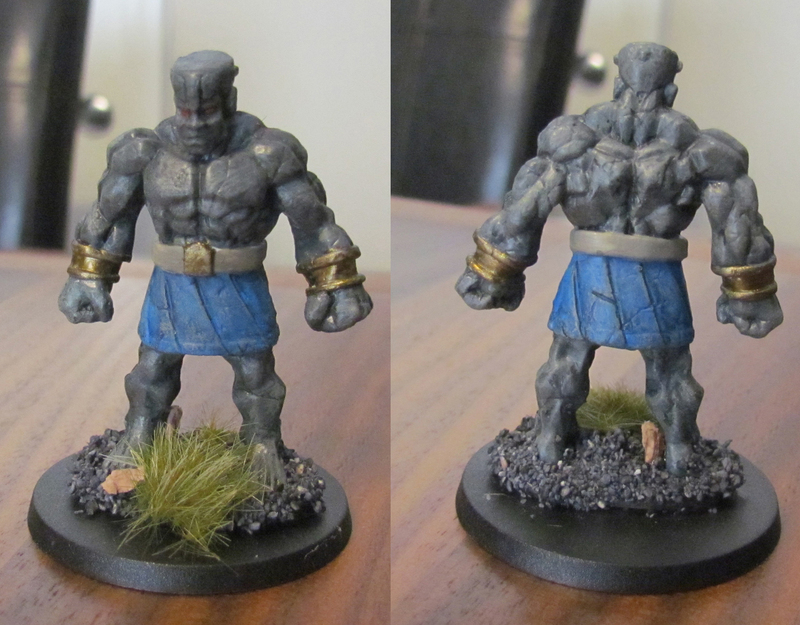 In contrast to a standard D&D Stone Golem, this guy is actually pretty short. Still, the sculpt looked solid and detailed and I was inspired by some Greek sculptures I saw (the kind that are painted; most of what we see in museums have their paint worn off by the long march of time). 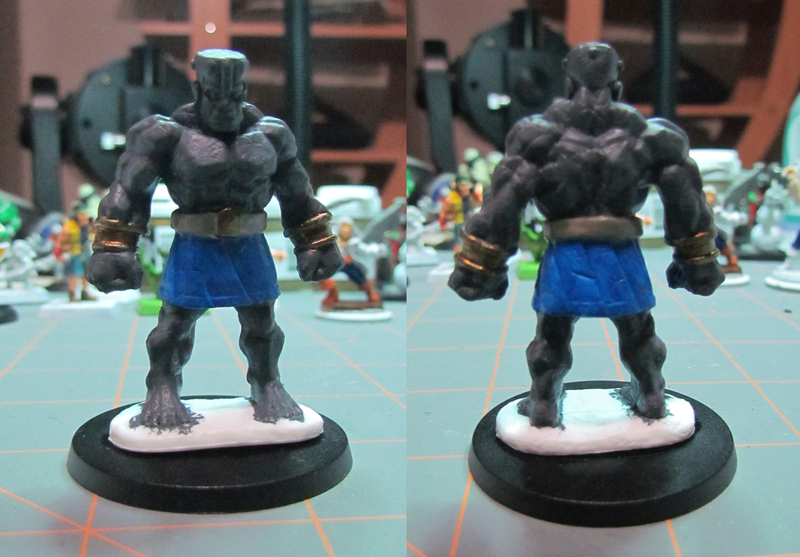 Here’s the miniature after I cleaned him up. I decided not to base coat/prime this one and just go for straight paint-on-Bones. I started with grey for the body, a dusty blue for the kilt, and antique gold for the bracers. I used a lighter grey for the belt and the same antique gold for the buckle. 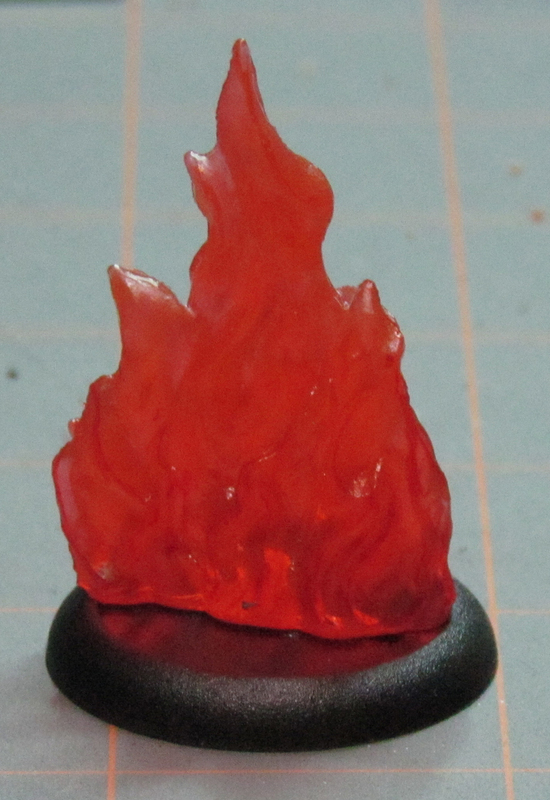 Already I was kind of blown away how this miniature was turning out compared to the last batch. Of course, the fact that it’s a fairly simple design probably helps, despite the amount of detail visible. Next, I thinned out some black paint and made a wash. The pictures really don’t do it justice. I should adjust my lighting. You can see how the cracks in the kilt “pop” now from the reverse angle, though. So far, I’m liking the Privateer P3 paints. I think I have to invest in some 1 mL syringes (without needles) in order to get a bit of paint so I can create washes and mixes without wasting paint by loading up a brush to swirl around in water I’ve put in my palette*. 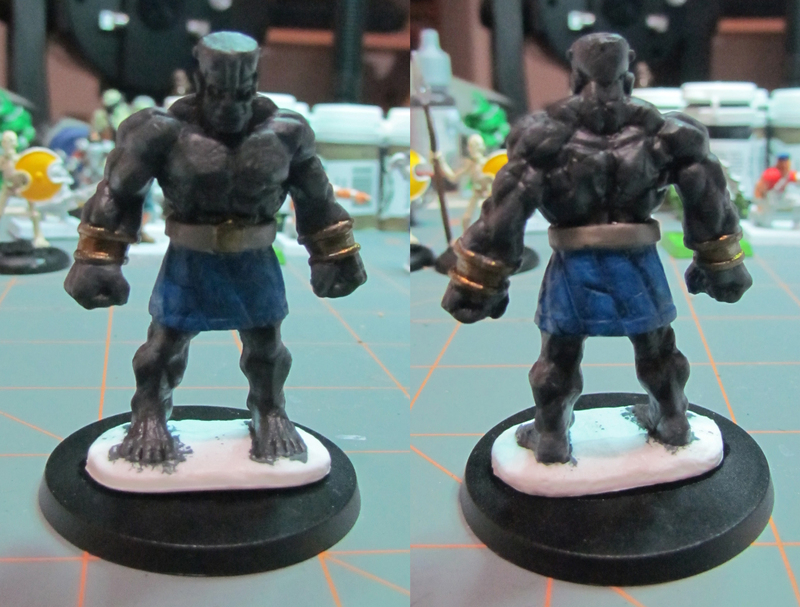 After the wash dried, I used some of the lighter grey (I think I used the same color that was in the belt) to dry brush the entire miniature. At some point, I also painted his eyes red, to reflect the malevolent magics that were animating this half-naked, ripped statue. I decided to call this miniature “Done” and base him. I didn’t take pictures of my first attempt. I was horrified at what I had done. Fortunately, when you use Elmer’s glue to affix your basing materials, you can just peel them right off (though they stay on perfectly well if you’re not trying to remove them). It’s not bad, actually. I’ll probably apply just a bit of extra color to the brown clumps, but overall, I’m really pleased with this miniature. 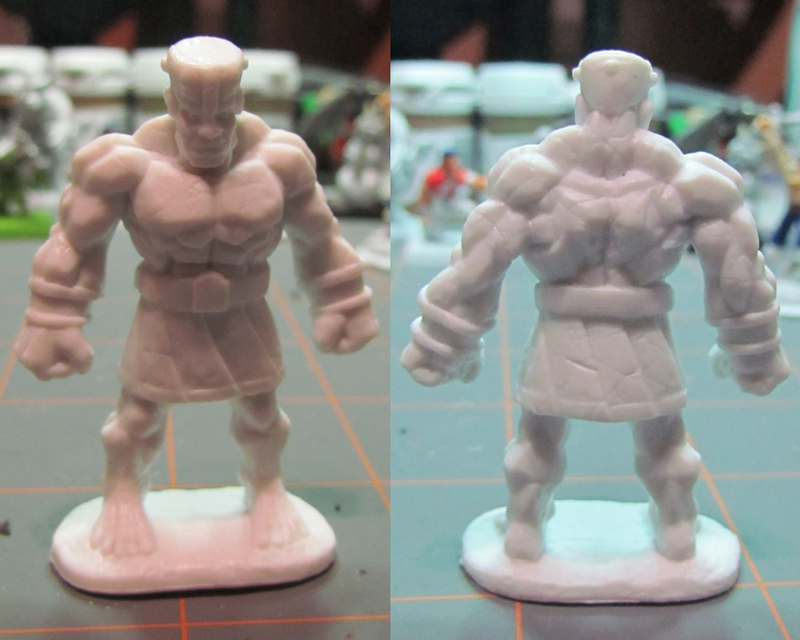 It’s the best I’ve done out of the Bones Kickstarter minis so far, and one of my best overall. I might actually take this one over to my FLGS for their monthly painting contest (although, most of the entries I’ve seen are “busier” miniatures than this one). Dem Bones – Fire. Fire! FIRE! For my next magic trick, I shall bring light to fire. One of the challenges I knew going into the Reaper Bones, was how to paint the translucent miniatures. One school of thought is that you need only a few washes and highlights and you’re done. Well, my skills really aren’t up to that challenge (it’s harder than you think since thinned-out paints don’t have a good track record of adhering to Bones miniatures). Another school of thought is to just base them and move on. After gluing it to a base, I decided to take a third option. Come to think of it, I think I forgot to wash this mini. No matter, I wasn’t painting it anyway. 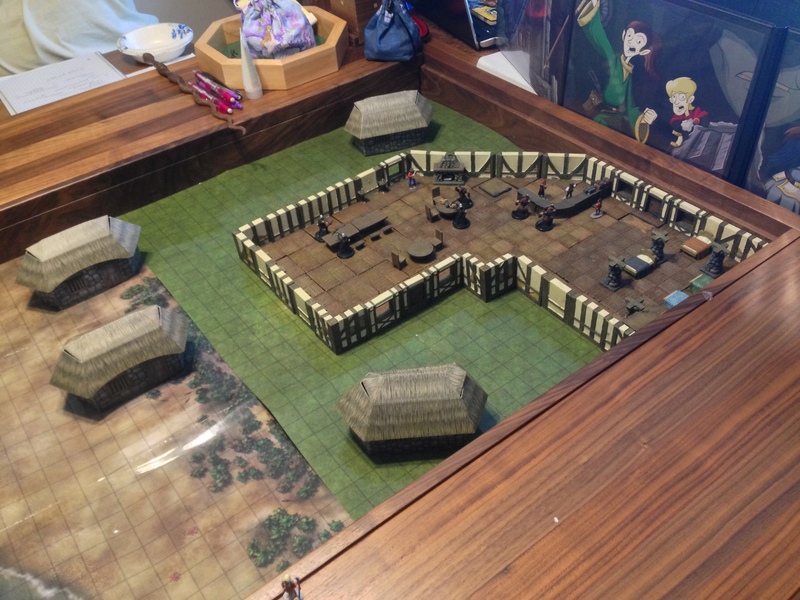 Owen K. C. Stephens (whom I spoke to several times at Gen Con, yet not about Reaper Bones at all) posted on Google+ his technique of highlighting the fire with Sharpies and basing the minis on LEDs. I happen to have a plethora of Sharpies. You could even say I have myriad Sharpies in my basement. 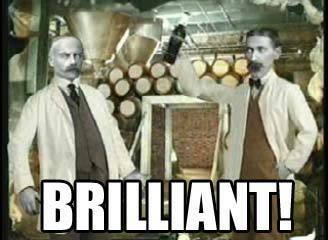 My first wife was an avid scrapbooker and she bought stuff. A LOT of stuff. Stickers, stamps, paper, paper cutters, Sharpies, gidgets, woo-has, Wangdoodles, and Hornswogglers, and Snozzwangers, and rotten, Vermicious Knids. Well, I gave most of it away after she died, but I kept a paper cutter (useful for cutting out map tiles) and the Sharpies (not to be confused with Shar Peis). 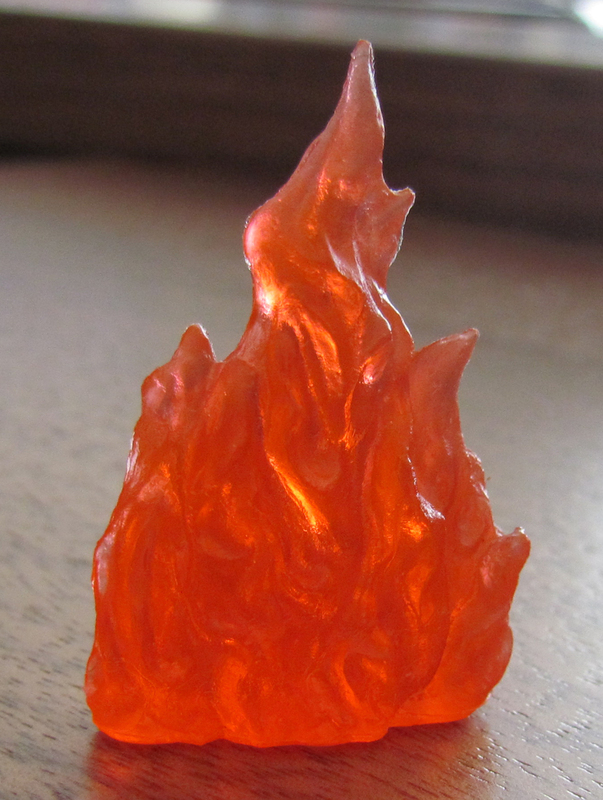 So, I used red and orange to highlight the edges of my fire. 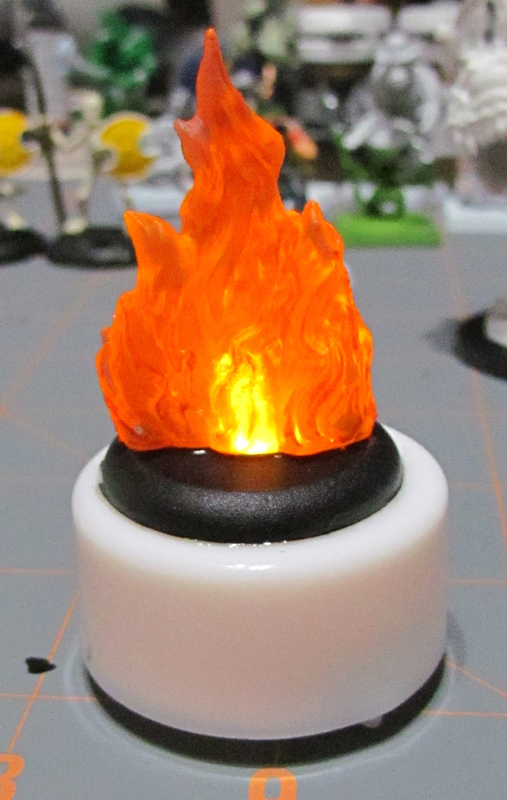 I found a source for flickering candle LED tealights on Amazon and bought 10 or so.I figured out how to remove the flame tip from the LED (it requires application of a sharp object). 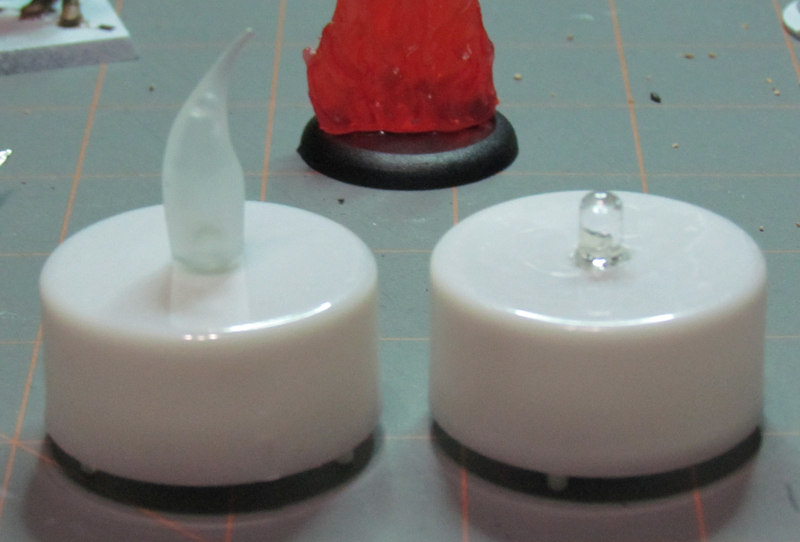 After carefully measuring the size of the LED, I drilled a hole in the base of the mini. I actually went a little too deep and off-center. Next time, I’ll drill the hole in the base and the mini BEFORE I glue them together so I avert the near-disaster that would be drilling through the side of the mini. I then glued the mini on top of the LED. It sits a little high, but apart from removing the LED from the tealight base and having wires run from the mini to some other location, this will do for now.